ST. JOHN’S PARISH, LOUSIANA -- The AmeriCorps St. Louis (ACSTL) Emergency Response Team will deploy to the Gulf Coast to provide leadership and disaster training in Louisiana in response to Hurricane Isaac. A team of six will deploy from the ACSTL office in Soulard Wednesday, September 12 and head south to the community of St. John’s Parish, Louisiana west of New Orleans where they will serve for approximately one month. These local AmeriCorps members will provide support for a volunteer reception center and homeowner call center. The ACSTL Emergency Response Team will join more than 275 National Service members previously deployed to aid in the response and recovery of the Gulf Coast in Louisiana, Mississippi, Alabama and Florida. ACSTL’s response in Joplin, Missouri after the May 2011 Tornado received national recognition including the Corporation for National and Community Service’s 2012 National Service Award for Disaster Services, as well as requests to conduct disaster trainings across the United States. About AmeriCorps St. Louis: AmeriCorps St. Louis is a non-profit which utilizes donated resources to address critical unmet needs in the areas of education, disaster services and environmental stewardship. Since 1994, the Emergency Response Team has assisted over 30 states, by quickly responding to underserved and overwhelmed disaster-affected communities – leveraging coordinated volunteers and assisting emergency management and disaster relief organizations to address immediate needs and develop an enhanced capacity to recover, especially for vulnerable populations. 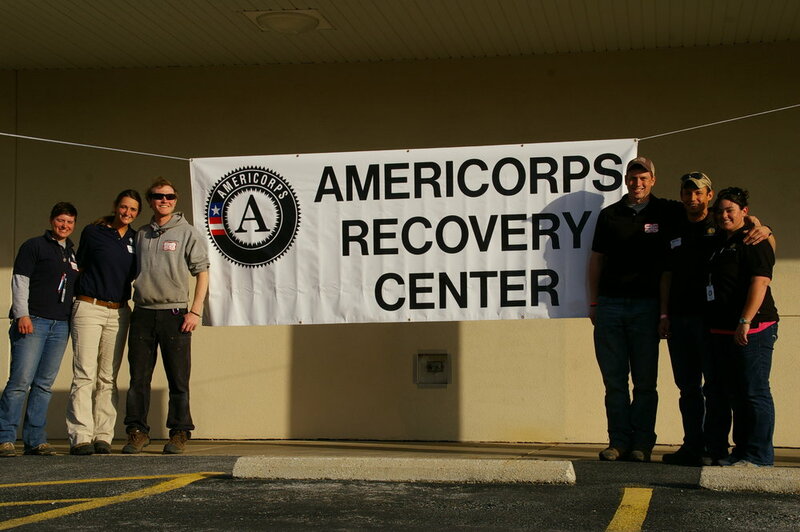 AmeriCorps St. Louis played a major role in past disaster responses within the Joplin, Missouri tornado and Hurricane Ike in Galveston, Texas. When not involved in disaster response, the ERT conducts community preparedness projects and undertakes natural resource stewardship projects to benefit the environment. 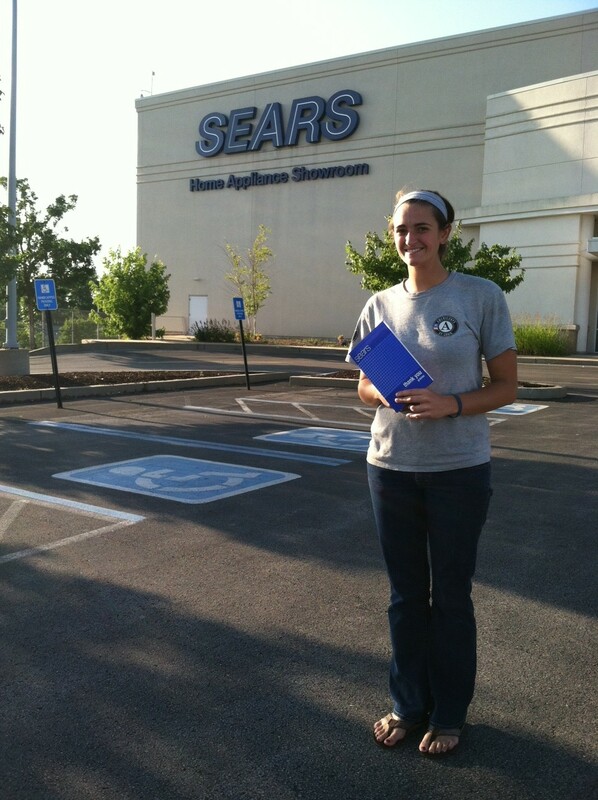 "I will be completing my fourth year and final year with my beloved AmeriCorps St. Louis Emergency Response Team. Come September I will be moving to Jefferson City to start a career with the State of Missouri in the Department of Public Safety, focusing on disaster preparedness and response. It has been nothing short of an amazing four years and no attempt at words of thanks, love, admiration, pride or growth will do it justice. I have met so many incredible people over the years. I have been inspired by those who have lost everything and can still find joy and hope, I have been humbled by the beauty of our forests and the strength of wildfire, and perhaps more then anything I have been forever changed by those people I have served along side. To my fellow national service members, I Thank You; for helping me become a better person and for giving of yourself so tirelessly. You are what this generation should be known for, open hearts, never ending passion, and a deep dedication to making our country, and the world, better than we found it. So many experiences have shaped my years with the Corps, but none can compare to the smiles, laughs, tears and sweat and we have shared. I could not have asked for more. To those who have dedicated their lives (government, NGOs and Faith based alike) to helping people recover- you amaze me. I have learned so much from you and look forward to continuing the relationship we have built to continue to serve Missouri and our nation by being a model for disaster preparedness and response. To the communities and individuals I have served- your strength and perseverance will guide me throughout my life. Maybe the people I will miss the most are those I have yielded chainsaws beside to tame the never ending cedar or honeysuckle, those I have battled flames with to protect homes, and those who, with so little recognition, continue to fight the fight to respect, conserve and help all enjoy our natural areas. I do not know when our paths will cross again, but I have been forever changed for knowing you. I found friends in very unlikely places with so many of our conservation contacts and I thank you, for being you and the passion you bring to such an important mission. I have been supported by so many amazing people during this journey, people that sacrificed so much to allow me to follow this passion. I have never thanked you, or apologized to you, for accepting only part of me, because you understood I was only half a person without having an avenue to serve others. My family, friends, and loved ones have all settled for less time and attention from me than they deserved. Thank you for understanding what this necessary journey has meant to me. Thank you for letting me come this far, and thank you for supporting me on the newest chapter of my life. Quinn Gardner served as a member of the Emergency Response Team for four years. Her final two years were spent in a fellowship position coordinating and supervising ERT members, service and conservation projects, and disaster response efforts. The sounds of hammers, saws and nail guns echo throughout the tornado devastated areas in Joplin and Duquesne. As rebuilding efforts continue, construction sites are becoming a common place to work for many volunteers who have come to help in the area’s recovery. According to AmeriCorps St. Louis and Rebuild Joplin, organizations working with the City of Joplin through the Long Term Recovery Committee (LTRC) to coordinate volunteer efforts, the number of volunteers traveling to southwest Missouri has remained steady throughout the summer. Depending on the stage of the construction, some work sites have needs for general volunteers, but currently many of the homes need the addition of skilled laborers to complete specific tasks. Gardner explained that all construction projects need various skilled laborers throughout the build, including electricians, plumbers, and masonry workers to help with the foundation and concrete work involved in the project. In addition, skilled carpenters, both framing and trim carpenters, are always needed as well. Those interested in volunteering should contact Rebuild Joplin at 417-623-0065, in order to be assigned to a project according to the skills of the group. Skilled volunteers will work on home construction, while non-skilled volunteer groups may assist with surveying, tree watering and other projects. All volunteers are encouraged to be flexible as volunteer needs change. Skilled volunteers who are coming to Joplin should bring a copy of their professional license or other credentials, including a business card or other documentation. AmeriCorps St. Louis tracks all of this information in a volunteer database for future reference. AmeriCorps also reminds all volunteers to bring certain items that are essential when working out in the heat. Shade tents, coolers with ice, and water for their group are important, as well as sunscreen and insect repellant. In addition, it is highly recommended that groups bring their own tools if they have them due to limited tool supplies to loan out to volunteers. Gardner said that those groups who have coordinated their visit with affiliated church groups in this area should continue to follow this process, as area churches are working with the LTRC to coordinate work in the recovery and rebuilding. Recently, other volunteer efforts have also been strong within volunteers’ home communities to help Joplin and Duquesne. Through fund-raising efforts, communities and volunteers can adopt a family that may need to purchase appliances or other items for the new home they will be moving into soon.Joining Hands in the Heartland is one such initiative of AmeriCorps St. Louis that partners families in need with volunteers wanting to help, but who are unable to make the trip to Joplin. A recent survey conducted by the LTRC shows more than 100 families have specific needs that people can help meet without ever leaving their own communities. If you are interested in learning more about these needs, please contact the LTRC at 417-625-9192 or follow them on Facebook (www.facebook.com/JoplinLTRC). If you are interested in the Joining Hands in the Heartland project, contact Chelsea at AmeriCorps St. Louis by calling 314-772-9002 or via email at Chelsea@americorps-stl.org. More information on this program can also be found at www.ACSTL.org . We have reached the final stretch of the trail! The part that we are working on is 8-9 miles long. We finished the back half in the 2nd week we were there. We made it past the halfway point on the front section last week. There is still another 12 miles of the trail to complete on the other side of the road, but there is logging going on so we can’t work on it until they are finished. I am anxious to get this section done! This is my 6th consecutive week on the bike trail and it is amazing to see the transformation. Bikers are already using it too! Two bikers stopped by our campsite a couple of weeks ago to tell us they loved the trail. It was such a great feeling to know people are actually excited about our project! It makes those 90 degree days in high humidity worth it. Even though we didn’t finish this week, we were able to build a lot of trail. We parked at a new spot this week so we could hike in form the far end. We hiked in over the trail that still needs to be dug, to the point where we ended the day before. And then we work our way towards our exit. We were able to take 15 minutes off of our hike in time. This week’s group has helped build some great tread for this trail. They have worked so hard to get as much done as possible. It was a really inspiring week, watching so many hard workers focus on this project. Even though some of the team members switch out week after week, and they aren’t always on this project, they still dedicate so much time and energy to it. While Batman might not live here, Missouri is home to thousands of bats. A fungus causing White Nose Syndrome has been found in and around many of the caves in Missouri and Illinois threatening the survival of the bat population. This past spring the AmeriCorps St. Louis Emergency Response Team has been working with the Missouri Department of Conservation (MDC) to help save the bats near the Current River in Shannon County, Missouri. Through a United States Fish and Wildlife Service Grant, The AmeriCorps St. Louis Crew was able to create an access trail that was needed to create the steel gate that would protect the bats from human interaction while they can regenerate the bat population. Equipment brought in steel that was used to create a 20 x 64 ft gate closing off the entrance to the cave. Jason Edwards, ERT Yr 18 saws a fallen tree to create the access trail. Click here to learn more about MDC Bat Management in Missouri. We need your help to keep projects like this going! Help support AmeriCorps St. Louis. After months of Republican obstructionism, the Senate last week unanimously confirmed Wendy Spencer to lead the Corporation for National and Community Service, which oversees AmeriCorps and other programs that encourage Americans to serve in their communities. The Republican blockading of Ms. Spencer, herself a Republican who has led Florida’s volunteer and community service effort under three Republican governors, had no justification. Finally, persistent complaints about the delay from service groups were heard. Ms. Spencer arrives on the job at a critical moment. AmeriCorps has been a favorite budget-cutting target for House Republicans. Their latest budget calls for eliminating the federal agency and ending financing for AmeriCorps — a move they pushed for in the last two budget cycles. Even with support from the White House, money for AmeriCorps has been shrinking. Republicans used to get it. Just three years ago, Congress approved a major expansion of the program with overwhelming support from both parties. AmeriCorps was to have 140,000 members serving this year, on projects like building low-income housing, cleaning up rivers and parks, responding to natural disasters and teaching at-risk students. Instead, the program’s operating budget for fiscal 2012 has been cut to $471.1 million from $500.6 million in fiscal 2009. There are now 82,500 members, down from 88,000 in 2010, even though hundreds of thousands apply to serve every year. Last year, the Points of Light Institute honored President George H. W. Bush, its founding force, for his efforts to promote national service and volunteerism in a televised tribute. Now some Republicans who sponsored that event, including Representatives John Boehner, the House speaker, and Eric Cantor, the majority leader, are abandoning AmeriCorps and its vital work. Ms. Spencer’s immediate challenge will be to work with President Obama and Senate supporters of national service to keep the program at the current level. She will need to reach out to House Republicans, who seem to have forgotten the value of community service. A version of this editorial appeared in print on April 6, 2012, on page A22 of the New York edition with the headline: Congress Needs to Step Up for AmeriCorps. "It became extremely evident to me that I was part of a truly special team, and it made me very proud to be a member."